When Junior tells his parents that he’s Republican, Dre and Bow freak out! Watch two sneak peeks of tonight’s black-ish “Elephant in the Room” with guest star Bill Maher. The episode airs at 9:31pm ET|PT on ABC. During last week’s black-ish we met another member of the Johnson family when Dre’s (Anthony Anderson) baby sister Rhonda (guest-star Raven-Symoné) came to town to celebrate Mother’s Day. Of course this meant that Mama Ruby (Jenifer Lewis) was around too! The initial competition between Dre and Rhonda about who was their Mom’s favorite was funny to witness (Dre being breast-fed until he was six, WHATTTT?! )…but things took a turn when we found out Rhonda would be marrying her long-time partner Sharon (Elle Young). However, Mama Ruby still didn’t know Rhonda was gay…she thought Sharon was just her “mechanic roommate”. Bow (Tracee Ellis Ross) encouraged Dre to intervene and tell Mama Ruby the truth, but he refused. There were somethings the Black community didn’t talk about…”Please don’t ask, please don’t tell!” Eventually Dre realized that by not talking to Rhonda, he was essentially passing judgement. He embraced his sister, but might have gone to far by outing Rhonda/Sharon during Mama Ruby’s Mother’s Day brunch. Ruby almost fainted and called on Black Jesus to help her through. But Dre went to his Mom—Rhonda was who she was, and if Mama Ruby couldn’t accept Rhonda then Dre couldn’t accept his Mom. By the end of the episode, Mama Ruby and Rhonda chatted and Mom agreed to come to the wedding. I think my other favorite parts were Bow trying to make “Erykah Ba-don’t” happen and Jack (Miles Brown) and Diane’s (Marsai Martin) competition to get Bow the best Mother’s Day present. Diane thought she one-up’d Jack by stealing his presents (which she initially said were lame), but Jack’s hug won the day! Well, black-ish has never shied away from bringing up uncomfortable and slightly controversial topics and you know tonight won’t be any different! For me, Mama Ruby is the most hilarious part of these clips for a few reasons. First, PUBLICAN; second, once again calling on Black Jesus to help her through difficult news; and third, isn’t it SO interesting that Mama Ruby has the similar views as the Republican Party (immigration and evolution), yet she’s vehemently anti-Republican??? “Elephant in the Room” is going to be GOOD! 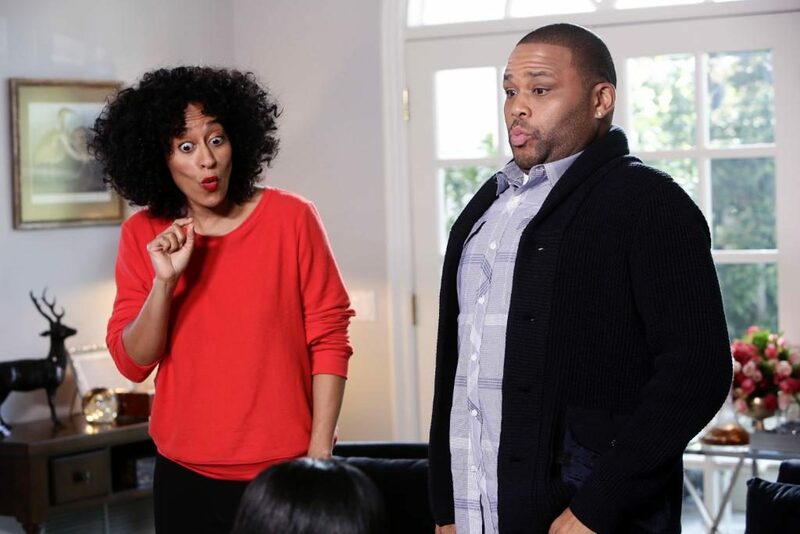 Make sure to tune into ABC at 9:31pm ET|PT for the new black-ish and come live tweet with me while we watch!